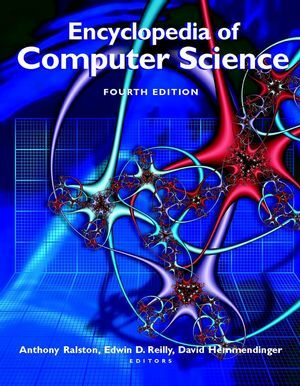 The Encyclopedia of Computer Science remains the definitive reference in the ever-changing field of computing. Now in its Fourth Edition, this influential work provides an unparalleled perspective on the major advances and applications of computer technology. Encompassing far more than mere definitions, each article elaborates on a topic giving a remarkable breadth and depth of coverage. And a 16-page colour insert highlights advanced computer applications and computer-generated graphics technology. Throughout the work the text is extensively illustrated with diagrams, figures and photographs. With contributions from over 300 international experts, the Fourth Edition contains over 100 completely new articles ranging from artificial life to computer ethics, data mining to Java, mobile computing to quantum computing, and software safety to the World Wide Web. Highly-regarded as an essential resource for computer professionals, engineers, mathematicians, students and scientists, the Encyclopedia of Computer Science is a must-have reference for every college, university, business and high-school library. Anthony Ralston is an Academic Visitor in the Department of Computing at Imperial College, London, and Professor Emeritus in the Department of Computer Science at the State University of New York at Buffalo, which he founded in 1967 and chaired until 1980. He is the author or editor of more than a dozen books on computer science and related areas, and a frequent contributor to leading books and journals in the field. He has served as president of the American Federation for Information Processing Societies and the Association for Computing Machinery. He is a recipient of the ACM’s Distinguished Service Award, a Fellow of the American Association for the Advancement of Science and a Fellow of the Royal Society of Arts. Edwin D. Reilly is Professor Emeritus of Computer Science at the State University of New York at Albany. He served as the first chairman of its computer science department when founded in 1967 and as the first director of its computing center in 1965. Prior to that time, he served in computer management positions at the General Electric Knolls Atomic Power Laboratory in Schenectady, NY. He began his career in computing at the National Security Agency in Washington in 1955. He holds the Ph.D. in physics from Rensselaer Polytechnic Institute and is currently president of his consulting firm Cybernetic Information Systems. He is the co-author of the textbooks Pascalgorithms (Houghton-Mifflin) and VAX Assembly Language (Macmillan, US). He is a member of the Association for Computing Machinery, the IEEE Computer Society, the American Physical Society, the Mathematical Association of America, Sigma Xi, and the America Association for the Advancement of Science. David Hemmendinger is Associate Professor of Computer Science and department chair at Union College, Schenectady, New York. He has also taught computer science at Wright State University, Ohio. His interests include programming languages, concurrent programming, and formal verification of hardware designs. He began work in computer science in 1981, having previously taught philosophy at the City University of New York, and at Antioch and Kenyon Colleges. He has degrees from Harvard (B.A.) and Stanford Universities (M.S. in mathematics), Yale (M.A., Ph.D. in philosophy) and Wright State University (M.S. in computer science). He is a senior member of the IEEE, and a member of the Association for Computing Machinery, Phi Beta Kappa, and Sigma Xi. Preface to the Fourth Edition. III. Computer Journals and Magazines. IV. Ph.D.-Granting Departments of Computer Science and Engineering. V. Presidents of Major Computing Societies. VII. Glossary of Major Terms in Five Languages. VIII. Articles Deleted from Previous Editions. IX. Timeline of Significant Computing Milestones.